The Media Comes To The Defense Of WikiLeaks At LeWeb: "The Leakers Will Win"
Today during the Media Panel at LeWeb ’10 in Paris, France, there was one thing on everyones’ mind: WikiLeaks. “This is a turning point for the Internet — it’s not just about WikiLeaks anymore,” Weblogs SL’s Julio Alonso said. “What happens to WikiLeaks will get applied to others later on,” he warned. “This is the first attempt at censorship of the Internet by all the governments of the planet,” Wikio’s Pierre Chappaz added. “Despite all the attacks, I’m optimistic that the information will survive,” he added. When moderator Adrian Monck asked if this would cast a shadow on the United States in particular, Techmeme’s Gabe Rivera said he thought it already has in some ways. 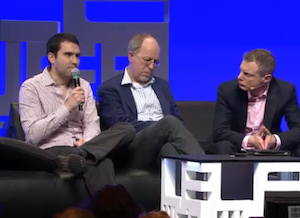 Rivera noted that just the tone of the crowd at LeWeb proves that to some extent. He also singled out U.S. Senator Joseph Lieberman suggesting that The New York Times could be a target because of their publication of some of the cables. “It underscores that there’s really no essential difference between what WikiLeaks is doing and what The New York Times does,” he said. Rivera said that is something to be concerned about. “We’ve pushed the theory of Internet censorship to the very edge,” The Wall Street Journal Europe’s Ben Rooney added. “We have to speak about what’s happening,” Chappaz said. “I’m amazed by the silence of the traditional media. This is a systematic attack. We have to explain to the traditional media. The stakes are about the free press,” he continued. Alonso agreed. “The first line of defense is speaking about it,” he said. Rivera added that the leakers aren’t going to lose this war. He cited mirror sites, Twitter accounts, Facebook messages, and all kinds of things that keep popping up to continue the data spread. “The leakers will win,” he said. The panel seemed fairly convinced that even if P2P networks had to replace DNS, the information would indeed end up winning. “The Internet is too strong. They’ll have a hard time getting it under control,” Chappaz wrapped up the panel with.